After pushing through I modified construction of 9 blocks I did not have it in me to add an additional row (even though I had the fabric to do it). Finding enough fabric in my stash for backing was troublesome as well. Since I figured that I would have to piece it and it was a square block on a square quilt I decided to experiment a bit and see how closely I could center the backing on the quilt. 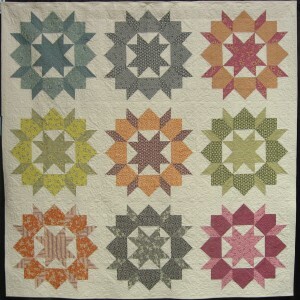 So I sized up the swoon block to be the entire back using some DS yardage that I had picked up from Joann’s. Not wanting to make the quilt any heavier than it already was I just paired it with some kona bone to try and match the Essex as close as possible. 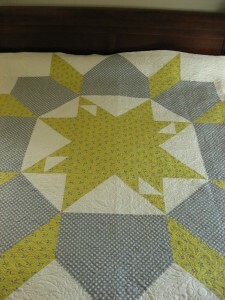 Since I was not really in love with the quilt yet, I didn’t want to spend too much on it… Although I did end up going back for more kona bone twice.. 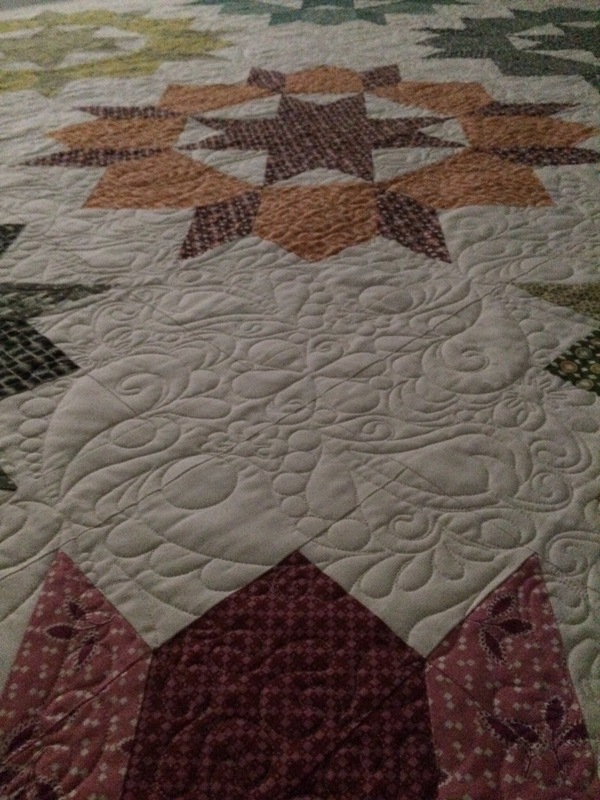 When I started quilting this quilt I started by basting it through the middle and worked toward both ends. 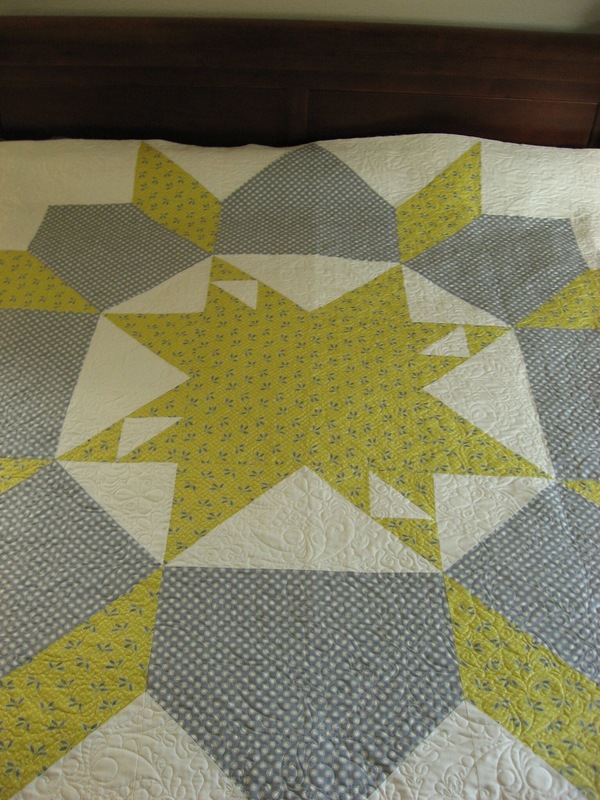 For the quilting I wanted something that would emphasize the circular nature of the blocks and take advantage of the negative space between the blocks. When I found Anne Bright’s wreaths I was intrigued but when I saw that they came in halves that were designed to be used as an E2E pattern I was sold. 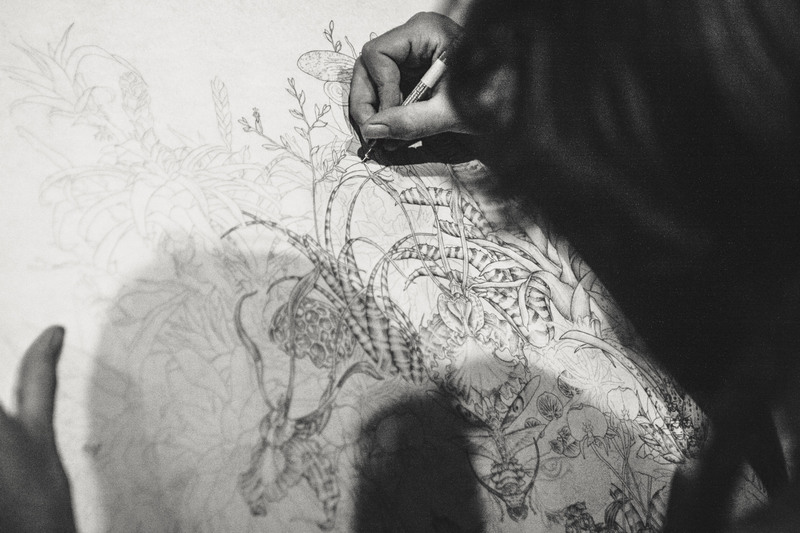 This meant that as long as I was careful I would have very few stops and starts. I ended up centering the wreath motif in the center of each negative space as well as on top of each star. 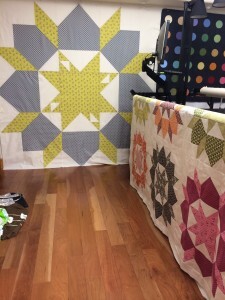 Once quilted I started to like the quilt more, but ended up taking it back up to the trainers at my longarm dealer to see what they thought and see if they had any suggestions. They loved it and suggested that I enter it in an up coming quilt show. This meant that I had to go take care attaching the binding and add a sleeve and label on the back. 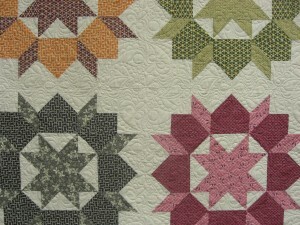 But I figured that it would probably give me some exposure as a new longarm quilter in the area. I ended up entering it in the modern division of the show, the only division that only receives a first place ribbon, no second and third. 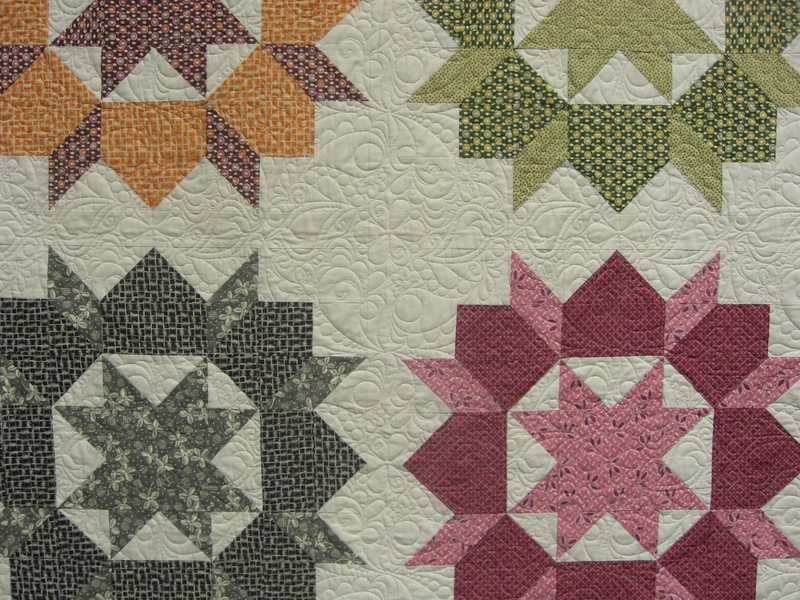 So I was not expecting much, other than some good publicity… I was surprised when I walked in to the show to find my quilt hanging with all of the other ribbon winners. 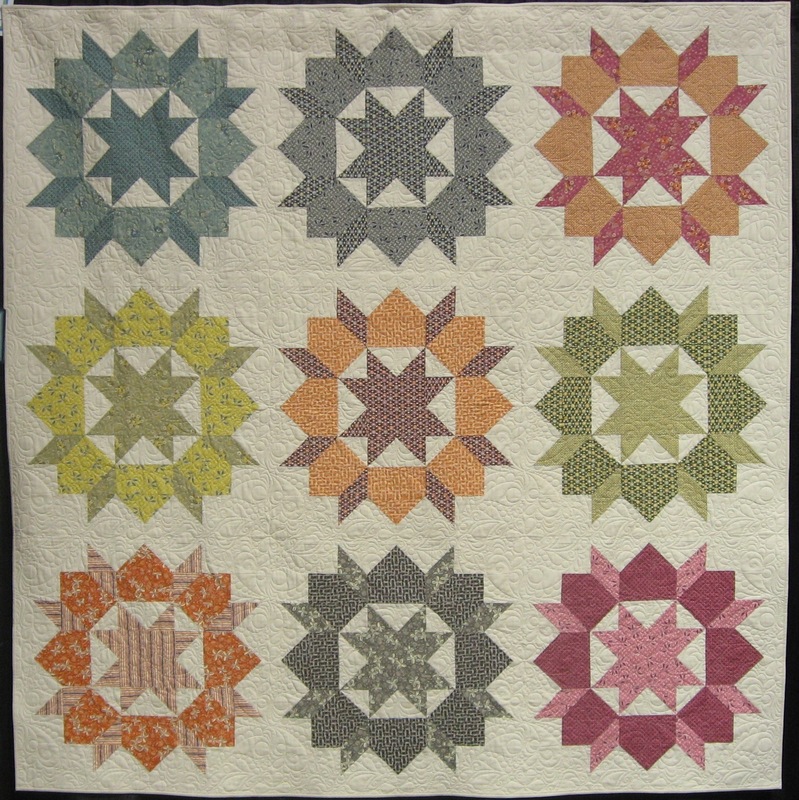 Apparently the judge was so impressed with the quality of the quilts in the modern division that two honorable mention awards were given out as well. My Valley Swoon being one of them.